Sorry for the gap in posting, as so often; marking and a professional need to finish up some publications have coincided in an awkward way. But another one is now off to readers so I can manage a quick post, and the one that is up next is the one where I explain what I did with the discovery mentioned a couple of posts ago that the University of Leeds has its own coin collection with which, when I arrived in post in late 2015, no-one was doing anything much. As explained there, for various reasons I couldn’t just start doing it myself, but I could try to get money for someone else to do it, and that is indeed what happened. There were various funding sources I considered for this, but the one that eventually looked like the best bet was a scheme that is now spread to quite a few universities, the Laidlaw Undergraduate Research and Leadership Scholarships. These are a bit more than your normal involve-the-undergraduates-in-a-research project affairs: though that is the core of them, they aim help people who otherwise could not get to the top of society, to create new educated critically-thinking leaders for the future from all levels of society. To that end, as well as the research project, there is also a whole set of leadership training activities designed to ensure that the lucky recipients would be able to take charge of any situation in which they should find themselves with all the wit and intelligence that the best undergraduate educations should imbue. It’s a powerful mission, and one which, in this iteration, involved a range of activities under the heading of ‘cultural capital’, visits to things like theatre, opera, wine-tastings and so on that were meant to equip the person who has never experienced those things with the familiarity that will prevent those who have, and think they’re important markers of education and distinction, from dismissing these new leaders; in short, to give them the tools to level with elitist snobs. I’m not sure whether this is to reinforce or to undermine the British class system, but as someone with many stories of such exclusion, some even my own, I see its power. It’s also fascinating that the language we have for it has to come from 1980s French anthropology, too; we ourselves couldn’t look at it that closely, it seems.2 Now, for better or for worse, that seems to have been dropped from these scholarships in favour of an international component, which may be better directed toward the future I suppose. But, dear reader, I digress. Whatever the wider social intent of this scheme, then, the core of it is still a research project, on which it will pay a student to work for twelve weeks spread over two years. So, all the way back in January 2016, I looked at the coin collection, for something that was a self-contained unit that could fill that much work but still produce something, and I lit upon the Winchester Cabinet, which is a rather fancy thing to have in a collection. It is actually a single big coin cabinet, complete with about three thousand coins, which were amassed and put in this same cabinet by one William Eyre in the late eighteenth century. At his death the cabinet was bequeathed to Winchester Cathedral, where he had apparently been a lay canon; they tinkered only minimally with it for nearly two centuries and then in 1954 decided to sell it the University of Leeds.3 So we have not just the coins but a collection, self-contained and almost closed since 1780 or so, of known provenance and association, whose collector could himself be an intriguing subject of study. Knowing that collectors are the hot thing in museums at the moment, and putting aside for a moment my reservations about privileging more or less modern human beings and their interests over the actual historical things we physically immediately have and what they might tell us, I decided that this was our hook, and so I wrote a proposal for a project called “Unlocking the Winchester Cabinet” and sent it in to see who would bite. And it got selected, so quite quickly I wound up interviewing several eager students all of whom wanted in on this opportunity, all of which was quite flattering but rather unexpected. 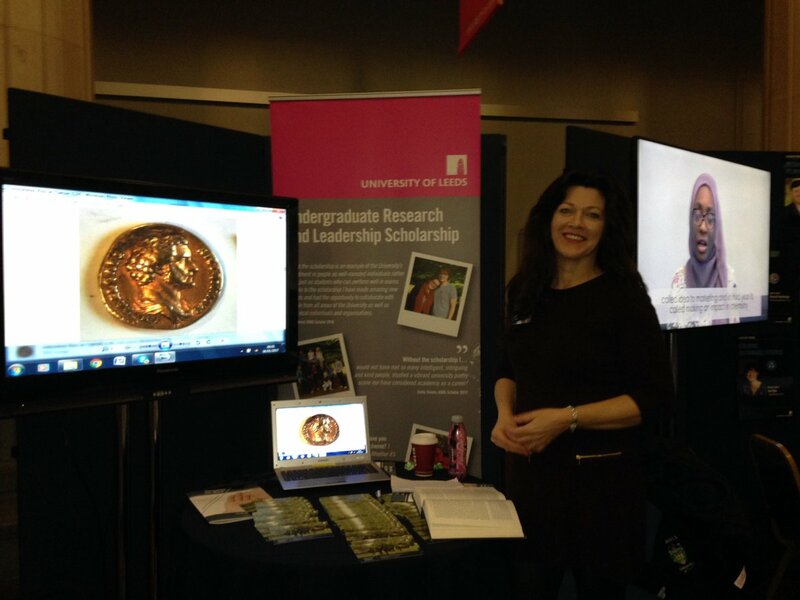 Emma Herbert-Davies promoting the scheme with, as her Twitter feed explains, the aid of Emperor Antoninus Pius, and whose better could there be? Well, the successful applicant was one Emma Herbert-Davies, who has been exactly the kind of star we rather expected she would be; she has put in far more work on this collection than we could ever have paid her for and become quite the face of the Leeds coin collection, leaving me as the kind of scheming Brian Wilson in the background (which is fine by me). She’s catalogued quite a chunk of the cabinet, including many different numismatic cultures and areas, and I don’t know how many papers she’s given on this now but I know that it’s more numismatics papers than I have. Emma is not the first person I’ve trained up from zero as a numismatist, and I bet she won’t be the last, but she’s certainly the one who’s so far become best known in numismatic circles and here, again, the student may well have outstripped the teacher. So, I will not steal her thunder here, I will just point you to her work, which is what all the money and study went towards. 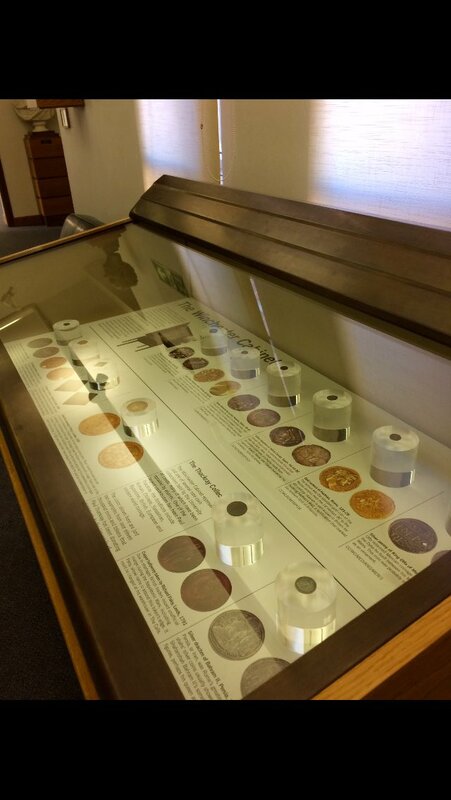 Firstly, there has been since October 2017, should you be in Leeds and willing to negotiate your way into the Brotherton Library, an actual physical display of some of the coins, mostly with Emma’s captions and selections but also with two of my own; I’ll post something else about this soon when I have better photos, but meanwhile here is one of Emma’s. But, in case you are not in Leeds or have no such library card, there is also a virtual exhibition, with more material in it, which showcases not just Emma’s grasp of the general interest of the coins but also our Library’s rather good digitization; it looks pretty smart and you can zoom in to an almost silly degree. So if you have some time and like coins, do click through and give Emma your web-traffic! I am very pleased with what we have, and by that I mainly mean she, has been able to do here. 1. Which, for those of you not fluent in UK numismatist, is Elizabeth Pirie (ed. ), Coins in Yorkshire Collections: Part I, Coins from Northumbrian Mints, c. 895–1279; Part II, Ancient British Issues and Later Coins from other English, Irish, and Scottish Mints to 1279, Sylloge of Coins of the British Isles 21 (London 1975), no. 1105. 2. The originator being Pierre Bourdieu, as in his “Ökonomisches Kapital, kulturelles Kapital, soziales Kapital” in Reinhard Kreckel (ed. ), Soziale Ungleichheiten, Soziale Welt Sonderheft 2 (Göttingen 1983), pp. 183-198, trans. Richard Nice as “The Forms of Capital” in John G. Richardson (ed. ), Handbook of Theory and Research for the Sociology of Education (New York City NY 1986), pp. 241–258, whence online here. 3. We have (and again I mainly mean Emma Herbert-Davies has) found out quite a lot about the cabinet, its original owner and its subsequent history, but I have to admit that why this happened no-one has been able to tell us. This entry was posted in Institutions, numismatics and tagged Emma Herbert-Davies, exhibitions, funding, social engineering, students. Bookmark the permalink.